Laboratory Services | Alexander Katlan Conservator inc.
Just when it seems like everything in New York's art world emphasizes the new, it is refreshing to stumble upon an artists' membership organization that has actually nurtured the continuity of art-making since its founding in 1871. Established as the Salmagundi Sketch Club in the Manhattan studio of sculptor Jonathan Scott Hartley (1845-1912), the Salmagundi Club is still kicking 137 years later. Depending on whom you ask, its name derives from The Salmagundi Papers, the potpourri of essays that Washington Irving published in 1819, or from salmigandos, a stew of meats served hot in 19th-century dining rooms. Like several other surviving clubs formed around the same time in Philadelphia, Chicago, and Providence, Salmagundi initially provided gentleman-artists with a forum for jolly fellowship and with an exhibiting venue in an era before our ubiquitous “museums of contemporary art.” Also enrolled were collectors such as William T. Evans, who came to befriend the artists and then—rather conveniently—bought heavily from them. Jonathan Hartley happened to be George Inness's son-in-law, so it is no surprise that the club was long associated with tonalist painting, that Inness's son served as president 1901-1903, nor that the great master's palette and brushes are displayed prominently in the clubhouse today. Salmagundi's elegant townhouse, built in 1854 when this stretch of Fifth Avenue was first chic, was not actually acquired until 1917. Although it was immediately expanded with a large exhibition gallery at the back (to be renovated soon), the first-time visitor still feels transported to 1917 the moment he arrives. Particularly evocative is the handsome library on the second floor, filled with astonishing, museum-worthy archives and rare books once consulted by members for ideas and historically accurate details. Like any such club, the hallways are lined with intriguing artworks donated by past members, prize-winning works purchased by the club, and portraits of former presidents. 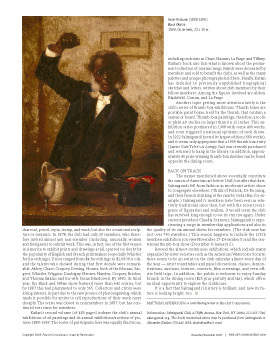 Making sense of this rich history is no easy task, so it is perhaps logical that a longtime artist-member who is also a painting conservator, Alexander W. Katlan, has recently systematized a key portion of Salmagundi's records. For decades now, scholars of American art have longed to know exactly who showed what when at Salmagundi's important exhibitions: Printed catalogues from its early years are rare, sporadic, incomplete, or missing. Building upon William H. Shelton's 1918 history of the club, Katlan has published—at his own expense—two massive guides that index Salmagundi's exhibitions. Both books list—to the fullest extent possible—artist names, exhibition dates, artwork titles, prices paid, the names of committee members who juried and judged submissions, and prize-winning works. The smaller of these tomes (274 pages) documents the first, and most interesting, decade of Salmagundi's annual Black and White exhibitions (1878-87). “Black and white work” meant etchings, engravings, woodcuts, monotypes, oils in grisaille, and drawings in crayon, charcoal, pencil, sepia, stump, and wash, but also the occasional sculpture or ceramics. In 1878, the club had only 29 members, who therefore invited almost any non-member (including, unusually, women and foreigners) to submit work. This was, in fact, one of the first venues in America to exhibit prints and drawings at all, spurred no doubt by the popularity of English and French printmakers (especially Whistler for his etchings). Prices ranged from $4 for etchings to $1,000 for oils, and the talents who showed during that first decade were remarkable: Abbey, Chase, Cropsey, Dewing, Homer, both of the Morans, Sargent, Whistler, Wiggins, Daubigny, Henner, Hayden, Cropsey, Bricher, and Thomas Eakins and his wife Susan Macdowell. By 1880, its third year, the Black and White show featured more than 642 entries, but by 1887 this had plummeted to only 365. Collectors and critics were losing interest, in part due to the new process of photoengraving, which made it possible for artists to sell reproductions of their work more cheaply. The series was closed to non-members in 1887, but has continued ever since for members. Katlan's second volume (of 480 pages) indexes the club's annual exhibitions of oil paintings and its annual exhibitions/auctions of pictures 1889-1939. The roster of participants here was equally illustrious, including such stars as Chase, Hassam, La Farge, and Tiffany. Katlan's book also lists what is known about the permanent collection of ceramic mugs (which were decorated by members and sold to benefit the club), as well as the many palettes and unique photographs held here. Finally, Katlan has included 16 previously unpublished biographical sketches and letters, written about club members by their fellow members: Among the figures involved are Abbey, Blashfield, Curran, and La Farge. Another topic getting more attention lately is the club's series of thumb-box exhibitions, a thumb-box being a portable paint box, held by the thumb, that contains a canvas or board. Thumb-box paintings, therefore, are oils or plein air studies no larger than 9 x 12 inches. This exhibition series premiered in 1908 with some 400 works, and soon triggered a national epidemic of such shows. In 1922 Salmagundi hosted its largest edition (689 works), and it seems only appropriate that a 1909 thumb-box exhibit (James Gale Tyler's A Lumpy Sea) was recently purchased and returned to hang in the library. In addition, approximately 40 prize-winning thumb-box sketches can be found opposite the dining room. The names mentioned above essentially constitute the canon of American art before 1945, but after that date, Salmagundi fell from fashion as modernist artists chose to congregate elsewhere. (Think of Pollock, De Kooning, and their friends drinking at the nearby Cedar Bar, for example.) Salmagundi's members have been seen as relatively traditional since then, but with the recent resurgence of figuration and realism, it would seem the club has survived long enough to see its star rise again. Under current president Claudia Seymour, Salmagundi is experiencing a surge in membership applications and also in the quality of its six annual shows for members. (The club now has just over 750 members.) This season happens to include the 125th members exhibition of oil paintings (on view November 17 -December 5) and the 100th thumb-box show (December 8 – January 2). Beyond the almost continuous exhibitions, which include many organized by sister societies such as the American Watercolor Society, there seems to be an event on the club calendar almost every day of the year—artist roundtables and panel discussions, classes, demonstrations, auctions, lectures, concerts, film screenings, and even off-site field trips. In addition, the public is welcome to enjoy Sunday brunch in the dining room ($20 plus tax), which offers an ideal opportunity to explore the clubhouse. 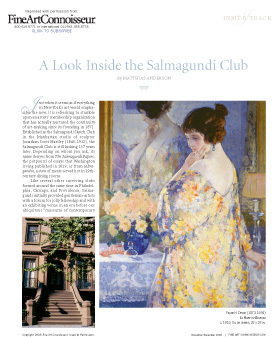 It is a fact that Salmagundi's history is brilliant, and now its future is looking bright, too. Matthias Anderson is a contributing writer to Fine Art Connoisseur. 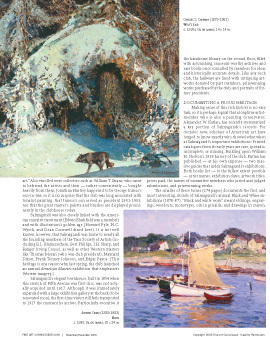 Information: Salmagundi Club, 47 Fifth Avenue, New York, NY 10003, 212.255.7740, salmagundi.org. The books mentioned above may be purchased from Salmagundi or Alexander Katlan (718.445.7458, alexkatlan (at) aol.com).